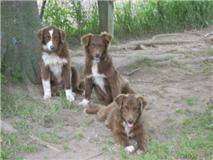 These three beautiful red-colored Aussie Girls need a home. The split face girl has some interest; waiting on confirmation. They are 5 to 6 months old. Can you foster one/all or perhaps adopt one? Please call Cathleen (303) 838-7068 if you are interested in these girls!